Under the patronage of His Highness Sheikh Mohammed Bin Rashid Al Maktoum, Vice President and Prime Minister of the UAE and Ruler of Dubai, the Royal Pavilion at Al Maktoum International Airport in Dubai South will host the Dubai HeliShow 2018, from 06-08 November 2018. The event which is held every two years, is supported by the Dubai Civil Aviation Authority (DCAA), as a strategic partner of this international aircraft technology and operation exhibition, that provides an ideal platform to identify the emerging trends and to learn about the latest technological innovations related to commercial helicopters and in areas of civil defense. Mohammed Abdulla Ahli, Director General - Dubai Civil Aviation Authority and Chief Executive Officer, Dubai Navigation Services, emphasized that supporting the Dubai HeliShow reflects the Authority’s keenness to strengthen the fruitful cooperation frameworks with the aviation industry stakeholders, in the interest of achieving security and sustainability, regionally and globally. Out of our commitment to contribute to the development of the civil aviation sector as a main constituent of sustainable development, we call on all stakeholders involved in the helicopter industry to participate in the upcoming event to showcase their products, services and technologies in the Middle East, which has the highest utilization rate for medium and large-scale fleets, confirming its potential as a promising market,” Mohammed Abdulla Ahli added. The 2018 edition of the event will feature two exclusive conferences” - Helicopter Technology and Operations Conference” and the “Military and Homeland Security Conference”. These two conferences aim to highlight important topics such as how to empower police forces with Internet of Things (IoT) tools; the role of women in homeland security; application of robotics in security and helicopters; tackling new patterns in narco-terrorism by integrating intelligence, forensics and response operations; best practices to boost joint inter-agency cooperation between armed forces and homeland security agencies among many others. The Dubai HeliShow 2018 will focus on a number of topics, including the development of aircraft repair and maintenance centers in the region, as well as improved operational efficiencies in command and control, smart computing, surveillance, recovery and e-defense capabilities. 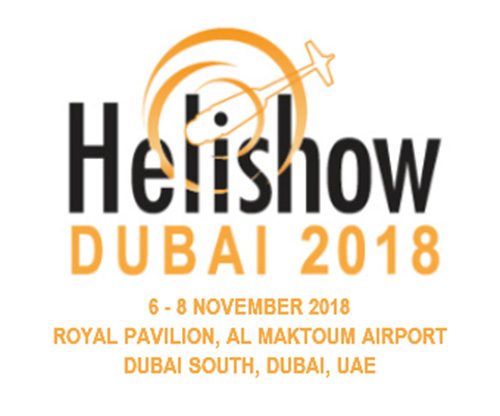 The show will also discuss the best ways to have a comprehensive internal security program and deployment of ground-based take-off and landing systems technology, as well as the development of multi-mission helicopters for joint search and rescue operations and the establishment of an integrated helicopter infrastructure in line with the requirements of the approaching Expo 2020 in Dubai. Aside from Dubai Civil Aviation Authority, the exhibition is also supported by a number of key government entities notably the Ministry of Defense, UAE Air Force, Dubai Airports, Dubai Police, and Dubai South. The event will provide a unique opportunity to explore a wide range of businesses and to forge promising partnerships with leading international carriers.